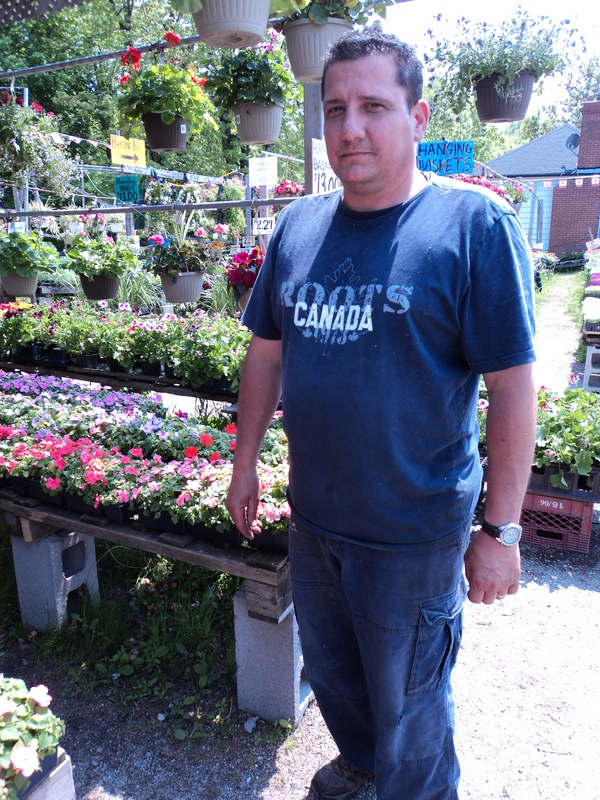 Pat had a day off this week and we made the trek into Etobicoke to a special little place where we like to buy our vegetable plants. 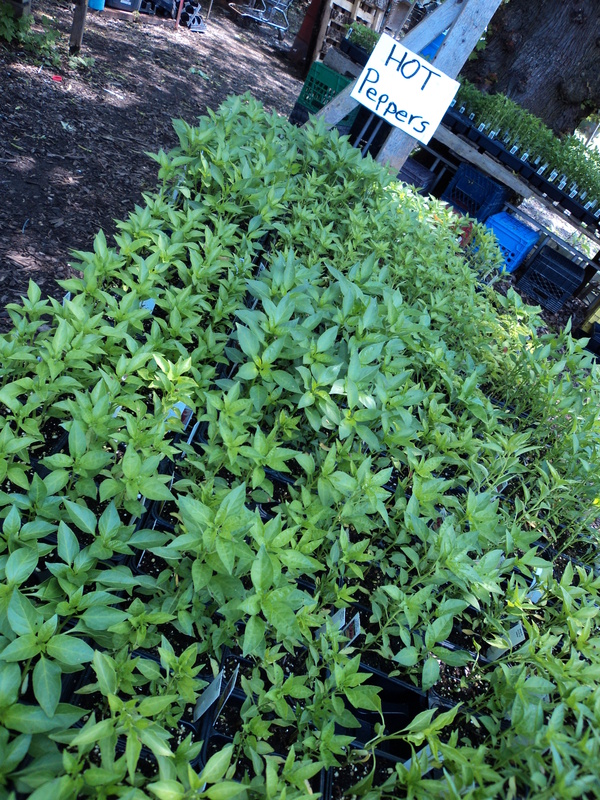 It isn’t a store, exactly–more like a parking lot-turned-nursery for a few months each year. “Lakeside Gardens” as it is called, is run by an Italian family who also owns the butcher shop next door. We stumbled on the place a few years ago and discovered that they have good variety and healthy plants. This year I went to see if they had any swiss chard–mine is coming along but seems rather slow. And I thought perhaps a few Roma tomatoes would be nice….and some red leaf lettuce looked so gorgeous I had to buy some…and then I found a ‘bush pickle’ that looked like fun for Tucker, who is a big fan of the Veggie Tales “Giant Pickle” character. (Maybe it will inspire me to make pickles?) I added some red geraniums to my tray, a few marigolds for colour in the vegetable beds (they are said to repel pests, too), and some ‘chocolate’ mint for a container on the back deck. I bought a little cell pack of red peppers, too, even though I swore off growing them a few years ago (they never yield very much fruit). They were just too lovely to pass up. Looking for the swiss chard, I got talking to Frank, who works there. He told me he is the owner’s son in law, and just helps out. “This isn’t a job, really” he said. “I promised him 15 years ago that I would take 2 months every year away from my job as a contractor and help him here. So here I am”. I appreciated my conversation with Frank because he was, well, frank. He was willing to talk with me about not just swiss chard (he gave me some great advice about cooking it with garlic and potatoes) but about his personal feelings and philosophy. I felt good talking to him, and encouraged somehow. I will confess I also felt a little bit jealous of this man who had a family excuse to take a 2-month time out to get his hands dirty like that every year! It was also nice to go into a retail environment and do more than just choose items and pay for them. Frank was not just a store clerk for me, but a real person who is dedicated to his family and finds joy in growing things. I was proud of myself for getting up the courage to initiate a conversation with him, which is something I would not normally do. And I was glad he was so kind and enthusiastic in return. This entry was posted in Uncategorized and tagged garden, plants, vegetable. Bookmark the permalink. I met Frank last year with Sharon. I bought a bunch of plants and soil for Irene’s garden…my first house sit. We had a wonderful chat as well, he’s been to Vancouver for a visit. His Father-in-law was there too and they both looked after me like old friends. I have chocolate mint growing all over the garden…it’s fun and it spreads very easily. A little girl who lives up the street from me called out from across the street one day “Chocolate Mint !” this was her way of saying hi to me because I always picked some for her when she was very young. She is 7 yrs old now. I’m glad you got to meet Frank. He’s nice, isn’t he? It makes perfect sense that you and Sharon went there, too. That’s funny about the child and the chocolate mint. Last year, a kid in our neighbourhood called us ‘the sunflower house’! When you’re ready to make the pickles (!) I have lots of jars that I’m not using, and all of the canning supplies if you’d like to borrow them. Happy to pass the jars off to a good home! That would be great…as long as we get that far!